They're finished! Complete! Perfection! 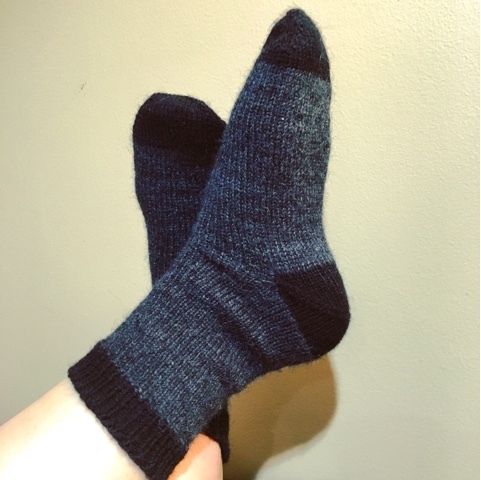 My toe-up charcoal gray socks are done. Actually, they've been done for awhile. Meet my new favorite sock. Let me explain. In a previous post I told you how I love the short row heel and thats my heel of choice. Well, I take it back. Move over short rows, hello after thought heel! 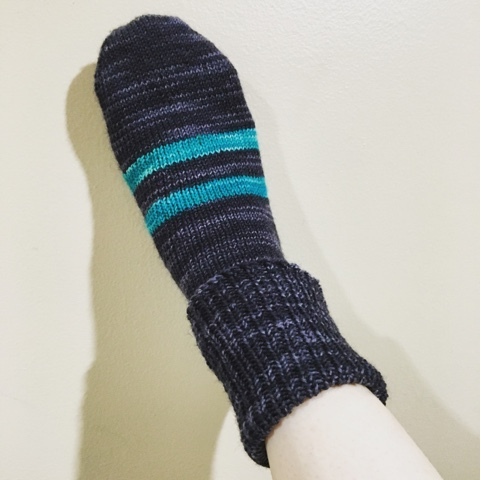 Where has this heel been in all of my sock knitting life?! I don't know if I'll ever knit a different kind of heel now. It's just so simple. I don't know if an after thought heel is good for a high or low arch, but it fits my foot perfectly. Another thing about these amazing socks? They are the perfect formula of stitches for my foot. I use size US 0 dpns and 56 stitches for the foot circumference. I've worn and washed these socks twice and both times they didn't stretch out after walking around in them all day long. I guess once you find the perfect formula for plain vanilla socks, you're set for life. So naturally I had to cast on for another pair! 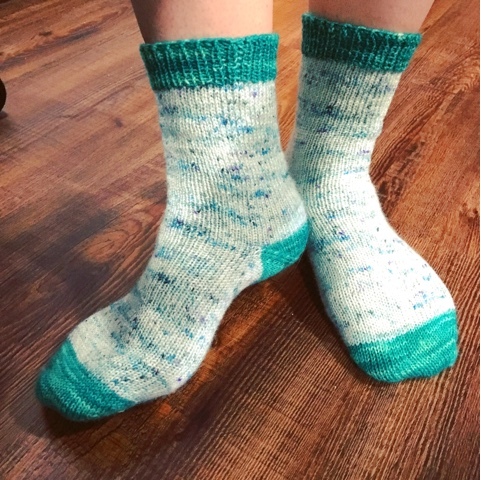 These next socks are knit using the same techniques and needles but I used my beautiful Knit Picks Hawthorne yarn. The main part of the sock is knit in the Aquatic Speckles color way. The contrasting toe, heel and cuff are in the Kettle Dyed Poseidon color way. (There's definitely an ocean theme going on with those names.) I absolutely love this yarn. Now I may not be the best judge on sock yarn since I've only used Patons for previously made pairs, but Hawthorne works wonderfully. It's soft and the colors are vibrant. I love knitting with the speckled yarn. It's so fun to see where the little bursts of color will be while you're knitting. I've worn them once and washed them and they bounced into shape immediately. I would love to try other brands but I'm determined to use up what I already own. Luckily, I bought 8 balls of Hawthorne in 4 different colors, so there will be no sock shortage around here! That being said, meet the latest pair on my dpns! 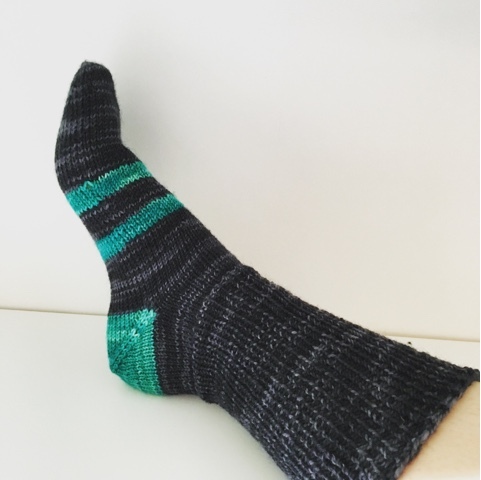 I've already knit up half a pair of new socks and of course, it's in Knit Picks Hawthorne. This time I'm using the Blackbird color way as the main body of the sock. For a pop of color I used Poseidon for the heel and two bold stripes on the foot. Obviously people won't see the stripes when I'm wearing shoes but I know it's there and that makes me happy. The leg of the sock is knit in a 1x1 rib and long enough to fold over. It definitely makes some warm ankles! The second sock is knit up to the beginning of the rib so I think I'll have a complete pair by next week. Socks are the perfect project for work knitting. I'm a hairstylist and sometimes I'll have 20 minutes here and there in between clients. It's so easy to pick up a plain vanilla sock. I can stop at any time and then hop right back in where I left off without getting lost. And how do I store and carry this pair of socks at work, you ask? Why, in my beautiful little project bag that I recently made of course!! YES!! I sewed this up using some old fabric my mom had for like ever. I went to Michael's and bought black canvas for the bottom of the bag. This was super easy to sew up. I used the pattern and video instructions from Hue Loco. Please check her out on her website and youtube channel! 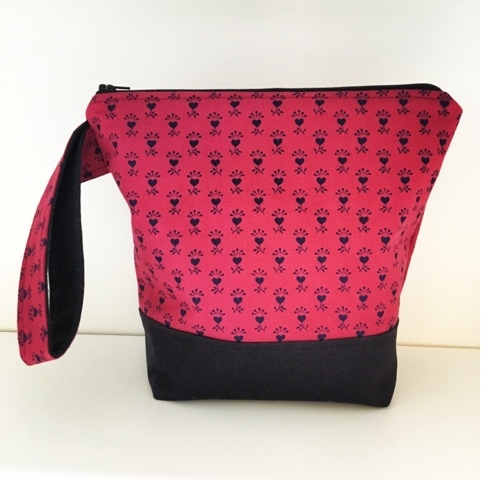 She sells these bags in her shop but she also graciously made the pattern available for free to download. FREE! I think that is so amazingly nice. And best of all, she made a tutorial video so you can follow along, step by step. I love having a visual so it was extremely helpful. The only thing that I did differently was add a long strap so I can carry it on my wrist and still knit standing up. I would love to make more of these and maybe increase the size for bigger project bags. I bought a class on Craftsy for sewing small bags and am looking forward to working with that also. It's so much fun playing around with different fabric pairings. 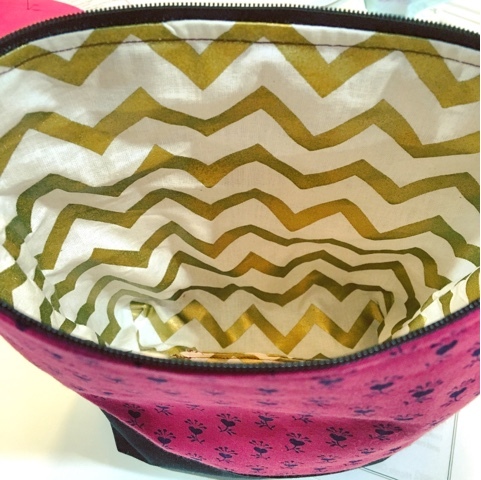 I found a gold and white chevron cotton at Michael's and it makes for a perfect lining. It's so bright and cheerful! Every time I open the bag it says "Hello!!!". This is definitely the perfect size bag for socks. I have so much fabric from IKEA that I would love to sew into bags. Maybe I'll even sew up some for Christmas gifts. I don't personally know too many knitters so I might have to make smaller ones for makeup bags instead. I could definitely see why so many people make and sell project bags. They really are a joy. Seeing all the amazing bags on etsy that people are creating and all the fun fabrics that they use is so inspiring. Give them a search. I bet you could easily find at least 10 bags that you'd love to have! Maybe one day I'll jump in too and set up an etsy shop, but I really don't have that extra time for it just yet. For now I'll just sew selfishly for myself and admire other peoples work. I keep forgetting to share these felted crocheted baskets that I made a long while ago. Oh, and look! It's holding my beautiful skeins of Knit Picks Hawthorne! (Before they were caked.) I was saying that I might take a brake from sock knitting after I cast off this last pair but I'm itching to use the other speckled color. So maybe one more pair before my brake? Or two? Or three? We'll see. I've also been thinking about picking up my tunisian crochet hook again and making some more dishcloths. Some of the ones that I made and have been using for the last 2 years are getting a little worn out. I don't have a dishwasher so I have to wash everything by hand, including very sharp knives. I'm bound to get a few holy dishcloths. That's another perfect small work friendly project to do. And just in case you were wondering, that beautiful crocheted doily that those felted baskets are sitting on was a very generous gift from my very talented friend from work. It's a Herbert Niebling pattern. I would love to crochet a doily that is so delicate but I just don't think my crocheting skills have reached that level yet. Definitely a crafting goal of mine for the future though. Happy Crafting everyone!! Hop on the sock train!! It's such an easy project that moves quickly, unless you're knitting a complex pattern. I didn't use a pattern for the baskets. I just winged it. I figured since it was going to be felted it wouldn't matter so much. I crocheted a flat circle and then stopped increasing and crocheted until it was a height I liked. Then I threw it in the washing machine and prayed I didn't mess it up! 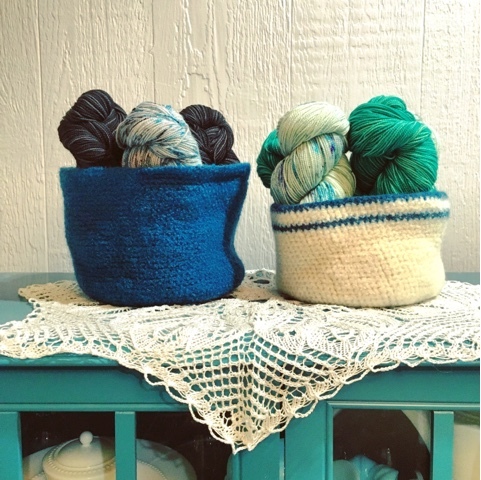 There are some lovely baskets on ravelry that I definitely want to make but I just haven't gotten around to it yet.